I just like “lost” and women in “troubles” in a way they lead their lives.,being unacceptable from own surrounding,being rejected for leading seemingly different life than usually others live;Regardless of how much is someone’s life derogated,for there are the ones who have observed it being “wrong”,first question to arouse over a habit of doom is:who has the right to judge one man’s life, since at one time there were established some basic Human rules for everyone;s existence in a form of freedom and leading life according to personal choice..That is clearly close to a Religion approach of judgment on what is right and wrong about every one’s behavior and deed. It was not by chance a way that i began this review on a LIFE,one Personality, a Writer,on a WOMAN.. to live in the past time and experience all the load of human doom;centuries have gone ,but greatness of HER left timeless tracks.It is about Jane Austen, loved and adored writer,whose real-life appearance made introduction in my writing. What kind of woman she was?If she wrote wonderful works for her lifetime to overcome all the changes of coming days,what was wrong of having not the same glory at the age when her works had become. There was happiness for Jane that her father understood and supported her writing and education,which made her great advantage, especially in regards to the time she lived .The most beautiful impressions that we meet by reading her novels, have been tribute to her vive and strong nature which sources lie in being in love with herself.It is again near to religion aspects of Jesus Christ’s heritage of being in love with ourselves as expression of the comprehensive principle in cherishing Love to all Fellow-Creatures. Her personal strength made her to stay true to the trueness of inner being ,rooted in natural law of going after real worths of which Love was the most dominant .She was not allowed to be “mangled” by accepting anything else but genuine LOVE.And when a man came into her life,she gave her heart and mind to him,despite being aware of social circumstances, which is at the end ,separated her from the final happiness. Such a combination of reality and romance is inevitable consequence of entire life of every being in earth.Fate and damn,happiness and joy,arm in arm,close and disjointed in miles by the very beginning of all the world.It feels like Damn gave its breathe to life conceived in one Being forever. We are most admired by Jane’s writing ,that is which attracts us to being astonished and leads to thinking of how a life looked like,what she suffered,what she loved, what she dreamed…For a moment please, try to think of her real life,the paths where she walked,the halls that she danced in,imagine her sitting in a living-room writing letters and lovely novels, see her holding hand of a man she loved and her eyes as seeking the proof of love, fast beats of the heart on tender look and kiss of her beloved,…think of her hopes to live together with her lover….How about all that you feel now,are your look and sense changed?It must be that you find yourself rising over her writing to feel much more of what she lost and left behind in her real life,and ask yourself for the price of such a life devoted to genuine principles of true LOVE of oneself and Truth-it is BEAUTY,and it is to me,the MOST VALUABLE Jane Austen left during her living .I’ll put it in the first place of all the achievements in her writing. Every time you remember me of Jane Austen and ask me for an opinion on Sense and Sensibility or Pride and Prejudice,I’ll take out of my memory her real environment in which she lived, to give real Tribute to her as a writer and woman.It was first which gave a birth to beautiful novels and stories she wrote. Jane Austen (16 December 1775 – 18 July 1817) was an English novelist whose works of romantic fiction set among the gentry have earned her a place as one of the most widely read and most beloved writers in English literature. 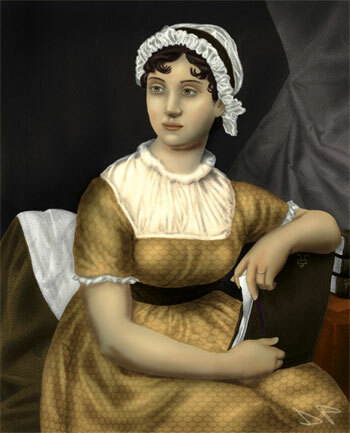 Among scholars and critics, Austen’s realism and biting social commentary have cemented her historical importance as a writer. Jane Austen is a well known and much-loved English author. Her fans today number in the millions and since the advent of motion pictures, her novels have been turned into film at an almost regular pace. Though just having publish a mere six novels, those few works have become the basis for the true romance story since their appearance on the literary scene in the early 1800’s. Thank you for writing so nice!